﻿ How to Beat Writer’s Block Once and for All » Red Mango Marketing! It’s everybody’s favorite part of email marketing. Yeah, right. Writer’s block is that wretched feeling when you’re staring at a blank screen, unable to find inspiration. You’ve set aside precious time to create your next newsletter, but now you can’t come up with anything interesting to say. If you’re one of those lucky people who never runs out of things to say, please bottle your inspiration and we’ll buy some! However, if you struggle to come up with good topics to write about, stick around. Here are six ideas to help you beat writer’s block once and for all. Anticipate that writer’s block will happen from time to time and keep a log of future ideas during times of high inspiration. You’ll be surprised how easy this is. Have an ongoing document where you can log ideas as they flow. Then, when you’re experiencing a dry spell, revisit your list for to find your next breakthrough. Another great way to be proactive is to plan out your email topics in advance. Use this worksheet to find your marketing opportunities and plan your message topics. With a plan in place, you’ll know that in say, February, you’ll be marketing about Valentine’s Day and your upcoming Spring Collection. Your plan will lay out what to write about each month so you’ll never have to come up with fresh ideas right on the spot. Keeping your marketing emails short is a good idea in general, but when it comes to working through a surprise writer’s block attack, it helps to stay focused on your picture, paragraph, and a call-to-action. What are you offering? 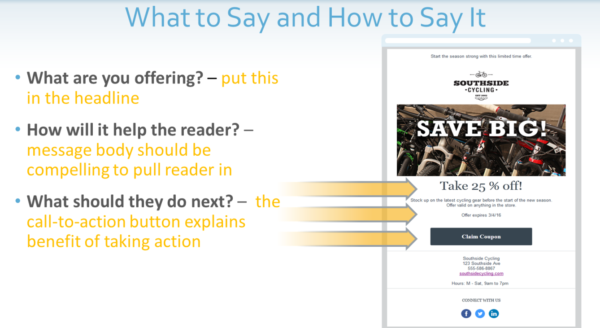 – This is your headline and its goal is to stop the reader and lead them to your message body. How will it help the reader? – Answer this question in your message body to pull the reader toward your call to action. This doesn’t need to be longer than 3-5 sentences. We’ve found that emails with 20 lines of text or less result in the best engagement. What should they do next? – Lastly, tell your subscribers specifically what it is you want them to do. Make sure the call to action is easy to find and click and leads them to where they expect to go. You and your employees should be keeping track of what your customers are asking you in email replies, in-store, online, and on social media. Not only does this help you keep your finger on the pulse of your audience, it also gives you guaranteed inspiration for future content. Find out what they are asking you and begin to answer them with your emails and blog posts. In fact, the inspiration for this post came from questions we received at a recent webinar! Always listen to your customers and help them find solutions to their problems. Sometimes you just need to stop stressing and get your mind off of the task at hand for a bit. Switch gears and work on another project for a few minutes. Are you painting your kid’s bedroom? Go do that for a bit. Been meaning to update a page on your website? Go do that. Sometimes switching gears is the best way to open your mind and get back in your writing groove. Then finish painting your kid’s bedroom, will ya? But don’t forget to pack a piece of paper or bring your phone! Do whatever it is that gets your mind off work and into a free-thinking space. Put your newsletter in the back of your mind, and while you’re moving about, the thought will cross your mind again but in a more thought-out way. Jot down a brief outline and return to your newsletter to finish it up. The spell will be broken. If you have any other tricks that help you overcome writer’s block, share them with us in the comment section. Oh, and for those of you with a bottomless supply of inspiration, seriously… share the wealth! If you’re looking for more practice beating writer’s block, check out our recorded webinar: Your Top Email Marketing Questions Answered here for additional tips. Ready to put these tips to work? Log in to your Constant Contact account to create your next email! Not a customer yet? Sign up for your free 60-day trial! 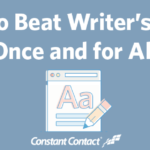 The post How to Beat Writer’s Block Once and for All appeared first on Constant Contact Blogs. This entry was posted on Wednesday, October 12th, 2016 at 9:30 am	and is filed under content, content creation, Email Marketing, News & Updates. You can follow any responses to this entry through the RSS 2.0 feed. Both comments and pings are currently closed.